Nearly every tourist destination has a graveyard. Yosemite National Park has a graveyard. The Arizona Memorial in Pearl Harbor and the Hiroshima Peace Memorial Park: both graveyards. The #1 tourist destination in Michigan has three cemeteries. America's best-preserved Gold Rush ghost town has five. Gettysburg is a National Park because it has a graveyard. Some graveyards are even tourist destinations in themselves: the Old Jewish Cemetery of Prague, the colonial burying grounds of Boston, and Kennedy's eternal flame in Arlington National Cemetery. Jim Morrison's grave in P re Lachaise Cemetery ranks in the top five tourist sites of Paris and draws a million visitors a year. 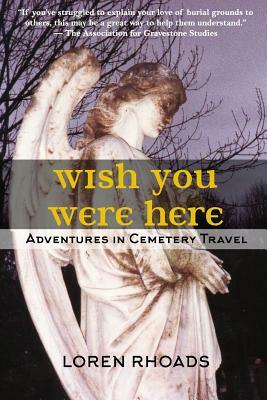 Wish You Were Here: Adventures in Cemetery Travel contains 35 graveyard travel essays, which visit more than 50 cemeteries, churchyards, and grave sites around the world. Over the past two and a half decades, Loren Rhoads has visited literally hundreds of graveyards. She is the author of 199 Cemeteries to See Before You Die. She edited the books Death's Garden: Relationships with Cemeteries and Morbid Curiosity Cures the Blues. Now she blogs about graveyards as travel destinations at CemeteryTravel.com.